Kieron Dixon tormented Batley Bulldogs as he scored four tries as London Broncos maintained their unbeaten start to the Betfred Championship season with a resounding 68-12 victory at Trailfinders Sports Club last Sunday. The Bulldogs had been hoping to extend their recent good run, but struggled to keep up with the Championship’s form side as London in 12 tries to move top of the table on points difference. It took just eight minutes for the deadlock to be broken, with Dixon crossing to finish a smart passing move, all coming from Batley losing the ball deep inside their own half and Jarrod Sammut landed the first of his six first half goals. Batley were dealt a blow when Shaun Ainscough was forced to leave the field with an ankle injury after less than 15 minutes. Dave Scott moved to the wing and Izaac Farrell came on to make his Batley debut at full-back. 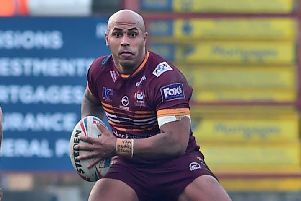 London continued to find success down Batley’s right-hand side as Dixon made 60 metres from his own line after a poor kick on the last tackle. The move ended with Dixon crossing for his second try and Sammut converted. Will Lovell then grabbed a third try in the opening quarter and another Sammut conversion extended the lead to 18-0. Batley did eventually work their way into the game, but despite earning repeat sets a Sammut 40-20 kick undid most of that momentum. From the resulting set, James Cunningham celebrated his England Knights call-up with a try from acting half-back and Dixon then completed a first-half hat-trick, with both tries improved by Sammut. Batley did get on the scoreboard before half-time, with James Brown bundling over for a try, which Patch Walker converted, but it continued to get worse for Batley before the break, with Sammut collecting a smart chip and sending Api Pewhairangi over for his first of the afternoon and Sammut’s goal sent London into the break 36-6 up. Dixon squeezed into the corner for his fourth try just three minutes after the re-start. Brown produced a strong angled run to grab his second try, which Walker improved. Batley continued to have a bright spell and Alex Rowe looked to have scored but the ball was ruled to have been stolen before grounding and a penalty given to the Bulldogs. Wayne Reittie then appeared to ground a kick from Walker but again the score was disallowed and Dominic Brambani was sent off for his protests. London took full advantage and ran in a further four tries in the final 10 minutes. Williams grabbed his second try on his 100th consecutive appearance for the, Pewhairangi completed his double, while Sam Davies and Matt Gee also touched down with Dixon landing the final four goals to cap an impressive display.